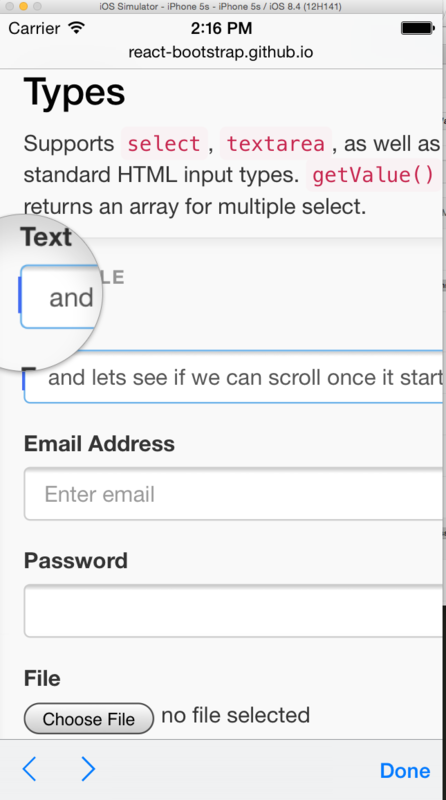 If you enter text that exceeds the width of an <input type=text> field, then try to long press and scroll back, it doesn't scroll. Reproable on the components CSS page. Originally filed this under React-Bootstrap, but affects the live Bootstrap.js components page as well. This does not appear to be Bootstrap-specific. I encounter the same problem on http://output.jsbin.com/xumeja/1 , where Bootstrap has been disabled, on my iPhone 5S running iOS 8.4. Jesus that's a gnarly bug. @twbs/team Can someone else please test this on their iDevice to double-check? Whoa you're right. I just tested google.com on an iPhone 5s with iOS 8.4 so it's not bootstrap specific at all! Indeed. Nothing we can do about it on our end though. The ball is in Apple's court.